Joseph Lichter is one of only about 100 people to have ever completed a Deca Ironman—10 Ironman triathlons put together. In 2017, he traveled to Switzerland to swim 24 miles in a pool, bike 1,120 miles along the Rhine River and run 262 miles without contact from the outside world. FIU News caught up with Lichter to talk about his experience. The senior chemistry instructor was recently appointed to director of the Pre-Health office. Lichter is also an Honors College faculty fellow who teaches the Tao of Sports. What made you want to run the Deca Ironman? It just sounded like something that was impossible. For me, the fear of not being able to complete something is sometimes the drive for me to want to try. It was almost an easy decision to compete in it because I wasn’t going to let myself back down from that challenge. Lichter came down with food poisoning the night before the swim. Competing while sick was “unbearably difficult,” Lichter said. Photo by Katrin Meier. 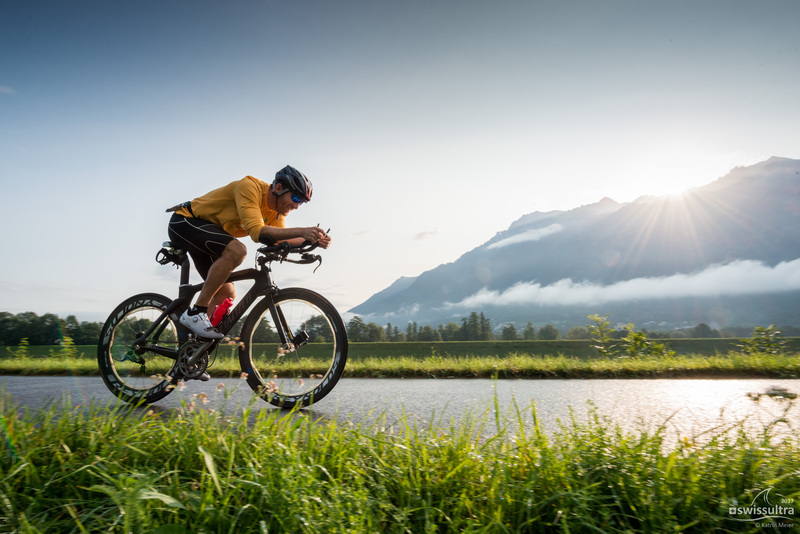 How do you train for a Deca Ironman? Considering that there are very few people in the world who have done it, there are not many online training plans that you can find. At the time of doing that race, I understood the main ideas of coaching for sports because I was already a certified triathlon coach. I wrote my own training program and consulted with another coach. A lot of the training that I did was long distance. I swam around Key West as part of my training that summer, which is a 12-mile swim. I did a lot of Ironmans on my own. I would swim at a local pool, bike for 112 miles and then run the marathon in a local park. One time I even did that back-to-back: one Ironman on a Friday and another on a Saturday. How did you qualify for this? You had to prove to the race director that you had completed an Ultra Triathlon sometime within a year prior. I had done a Triple Ironman in Virginia in 2016. Lichter rides his bike in Switzerland. Photo by Katrin Meier. While were you competing in Switzerland, what was your diet like? The eating is an interesting question because I have very strong feelings about malnutrition in sports. There’s all of these ‘tailored for you, lots of electrolytes, lots of dextrose’ products that are not necessarily what anyone eats naturally but have been considered improvements to sports. But when you’re going to exercise for days, your body will probably react poorly to these non-natural, performance-enhancing food products. I strongly encourage all of my athletes to eat whatever they like to eat normally, just not too much if they are doing something short. I ate sandwiches, I drank coffee, I ate fruit, I had snacks, donuts. You are burning upwards of 6,000-8,000 calories a day during the race, maybe even more, so I was trying to eat 4,000 calories every day to not allow myself to get into too great a deficit over the course of the 12 days. I did lose a significant amount of weight. I didn’t bring a scale with me, but I was visibly six to eight pounds lighter after that race. 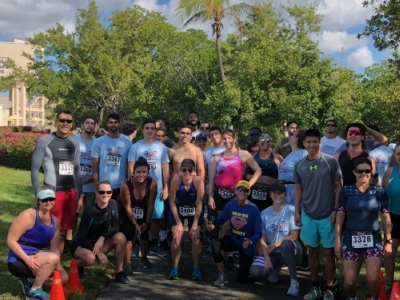 Lichter leads the FIU triathlon club, which meets on weekends at Biscayne Bay Campus. Photo courtesy of Joseph Lichter. 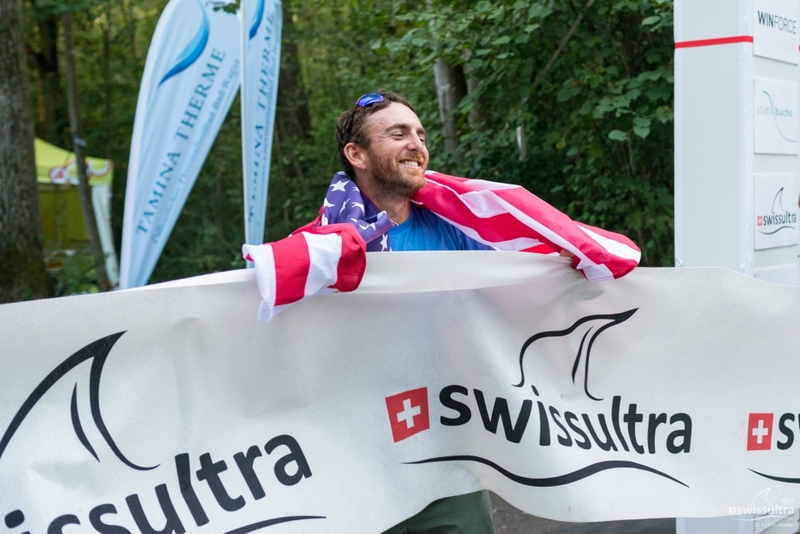 What was it like to return to the United States after the Deca Ironman? One high school teacher asked me to speak to his class while I was over there in Switzerland doing laps. He put me on a conference call with his school and I was rallying the kids. He told me that after I gave that rally cry, so many of his students were asking each other out. Can you tell me about your new position as director of the Pre-Health Office? I direct the advising staff and also meet individually with students and help them in their processes of getting into medical school, dental school and physician assistant school. I think one of the strengths I have from everything I do in triathlon coaching is helping people achieve their goals, and helping them deliberately do it with the proper training and the proper coaching. I think a lot of young people in the medical profession know they want to go for it, but don’t know what they have to do correctly, so having that background in coaching is helpful. But also having that background in the endurance—in the long-distance training—helps. It’s a long path to becoming a medical doctor. It’s often decades before students will be working independently with patients of their own. I hope to bring a lot of my experience in endurance sports to that office.